Faiek Davids believes one victory for the Cape Cobras should be enough to secure a home semi-final but hopes they can beat the Highveld Lions and Dolphins. Assistant Titans coach Mandla Mashimbyi was not too happy after their latest CSA T20 Challenge assignment and hopes for a better outcome. Gihahn Cloete and Matthew Breetzke paved the way for the Warriors to climb second on the CSA T20 Challenge table after they thumped the Lions in Johannesburg. Warriors assistant coach Mfuneko Ngam is seeking further improvement in their final two CSA T20 Challenge matches this weekend. Rain claimed its 10th abandonment of the T20 Challenge season after the match between the Knights and the Dolphins was called off. A thrilling 30-ball 55 by Aviwe Mgijima helped the Cape Cobras consolidate their position at the top of the CSA T20 Challenge with a win over the Titans. The Knights have appointed Werner Coetsee as the Central Franchise's assistant coach for the 2019/2020 season. Dolphins coach Grant Morgan concedes that every match in the second round of the CSA T20 Challenge has now taken on extra significance. Highveld Lions assistant Wandile Gwavu admits that the Titans have hit form at the right time of the season but says they do not fear them. 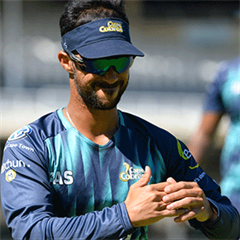 Assistant coach Faiek Davids is hoping the Cape Cobras can maintain their good home form in the CSA T20 Challenge when they face the Knights. Another superb Marco Marais effort helped the Warriors beat the table-topping Cape Cobras in their latest CSA T20 Challenge outing in Port Elizabeth. Knights coach Alan Kruger admits that it is make or break for his side over the Easter weekend in the CSA T20 Challenge. The Warriors v Highveld Lions CSA T20 Challenge match has had to be abandoned due to rain at Buffalo Park in East London. Rain continued to influence the CSA T20 Challenge after the encounter between the Knights and Highveld Lions was abandoned without a ball being bowled in Kimberley. Assistant coach Mfuneko Ngam says the Warriors are currently extremely frustrated after their weather woes in the CSA T20 Challenge. Dolphins coach Grant Morgan remains a frustrated following their start to the CSA T20 Challenge and hopes that his side can defeat the Warriors. The Cape Cobras have beaten the Dolphins in their T20 Challenge encounter despite some big hitting by Khaya Zondo and Rob Frylinck.